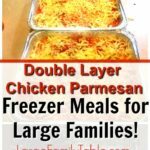 This Double Layer Chicken Parmesan Bake is one of those great freezer meals for large families! I was able to batch cook the shredded chicken that was needed for these five 9×11 pans in my trusty Instant Pot (you can see all of my favorite large family freezer cooking supplies here!). This Double Layer Chicken Parmesan Bake can be eaten on its own with additional veggie side items. You can also serve it over various noodles – my favorite is over spaghetti squash (here’s how I cook my spaghetti squash in the Instant Pot). This Double Layer Chicken Parmesan Bake is a wholesome large family freezer meal! Serve over your favorite noodles, spaghetti squash, or zoodles! This recipe makes FIVE 9×11 pans to help feed your freezer. Because we serve this recipe over noodles one pan seems to feed our large family of ten twice. Sprinkle 3 cups of shredded cheese as the next layer. For immediate meal bake at 350 degrees for up to 30 minutes. Wrap each 9×11 pan with two layers of foil. This Double Layer Chicken Parmesan Bake is one of the large family meals I completed during my recent freezer meals prep day! 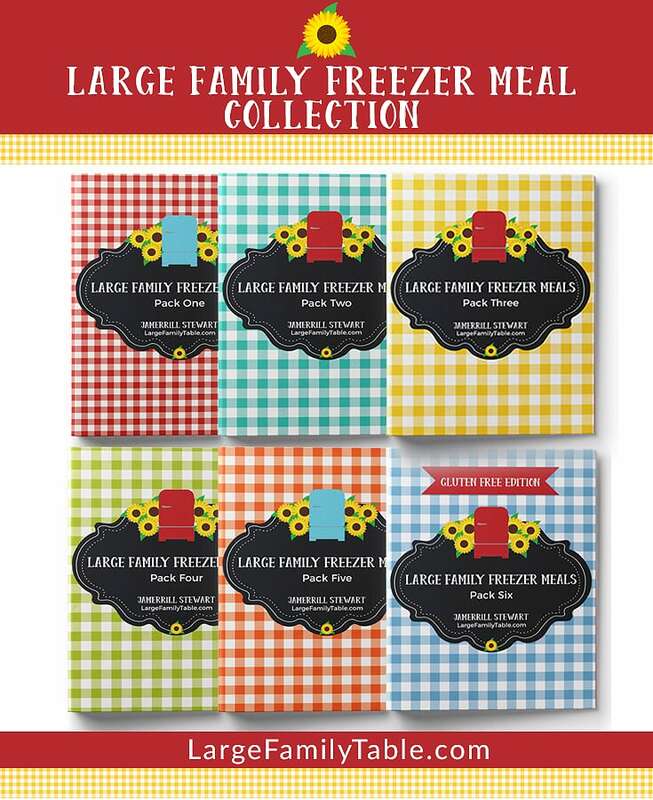 Click here to watch the freezer cooking YouTube vlog to see it in action.